Luxury Valley Homes Scottsdale Blog: Vincent van Gogh Art – The Housing Market – Terrifying? Occasionally, if they’re very lucky, they get to look back on their life and see the path that leads them to create a masterpiece. At the time, the path wasn’t easy, yet in retrospect, it looks very much like the only possible path they could take. We think in twenty years or even ten years, we’re going to hear the collective sound of people kicking themselves because they did not buy a home this year. Think about the future. Who might need a home? Is there an opportunity to “be the bank” when the time comes? The descendants of those savvy collectors who bought a Van Gogh painting for mere dollars in 1885 are surely grateful for their grandparents’ eyes today, aren’t they? Yes, there is uncertainty, but this is the calmest water you’re ever going to see. Set sail now and buy a home. Those that do will certainly be rewarded. As for the masterpiece – You’ll have the satisfaction of looking back and realizing you bought at just the right time. There’s certainly no risk to exploring the opportunity. We would love the opportunity to sit down with you and plot a possible course to the best investment you could make. 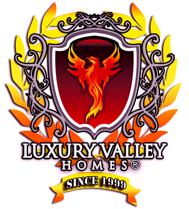 Contact the Luxury Valley Homes Team today at: 480-595-6412 or email us at Office@LuxuryValleyHomes.com.